In this article, we discuss 10 key facts that all Albertans should be aware of as we work to understand and evaluate these ongoing events. Treaties in Alberta. For complete map, see Southern Chiefs Organization. 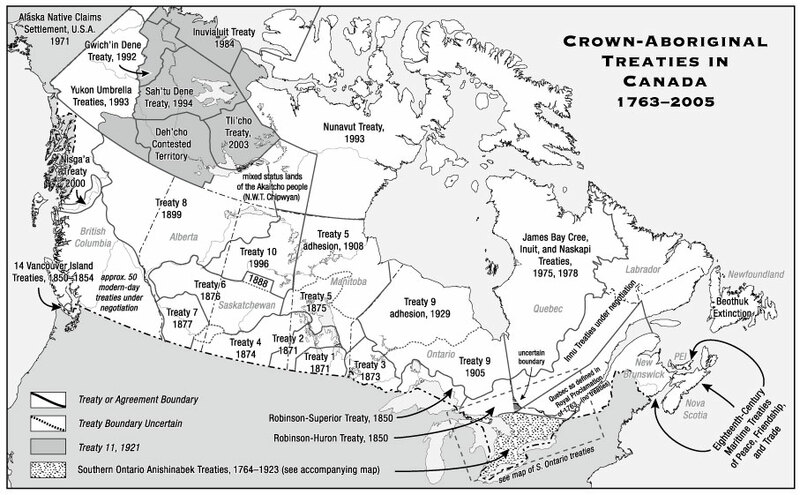 This map illustrates historical treaties dating from 1763 to 2005. More contemporary agreements referred to as modern treaties continue to be negotiated in areas without previously settled claims. However, the modern treaty negotiation process has been stalled as of late, and some British Columbia First Nations which have not signed treaties are questioning whether treaties are the best route for advancing their rights in light of recent court decisions on Indigenous rights and title. Six percent of Alberta’s total population is Indigenous, and approximately 23,000 Indigenous people from 18 First Nations and six Métis settlements live in Alberta’s oil sands region. A 2016 CBC publication discusses an unreleased government report that finds the government of Alberta is failing Indigenous peoples in the oil sands region, specifically with negative repercussions to their land, rights, and health as a result of industrial development in the region. 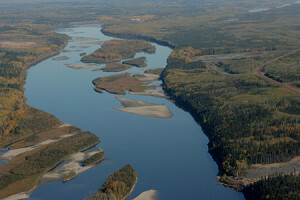 The article describes the report as “damning,” pointing to the prioritization of economic interests over traditional land use, the violation of treaty rights, and claims by Indigenous communities that the Lower Athabasca Regional Plan was being used against their interests. 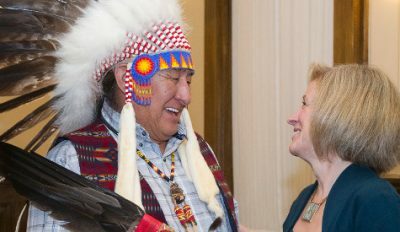 In BC, for example, until its recent electoral defeat, Christy Clark’s fossil-fuel-industry-friendly Liberal government and extractive industries – not just fossil fuels, but them in particular – had been anxious for greater “certainty” about Indigenous rights and title in relation to proposed developments, and was driving the push to make deals. The BC Liberal government’s enthusiasm in recent years to make more deals with First Nations to enable further resource extraction is a contemporary extension of the colonial development model, but in a somewhat more accommodating form. A 2010 publication by Parkland Institute, As Long as the River Flows: Athabasca River Use, Knowledge, and Change , illustrates the connectedness of Indigenous peoples with the land and the water, pointing to how their unique relationship with these ecosystems provides an opportunity to observe subtle, incremental changes over time that, as they add up, may be indicative of significant changes to the land and water. For example, traditional land use practices include spending a great deal of time on the land hunting, trapping, and fishing. When the land, waterways, and wildlife change, it is Indigenous people who are in the best position to observe these changes. When Indigenous people’s health conditions change in specific patterns in line with their location and their traditional land use practices – such as increased rates of specific forms of cancer in communities close to or downstream from oil industry activity – Indigenous people are well-positioned to observe those changes as well. Westman analyzes assessments that posit benefits to projects but do not include sources or calculations upon which they’ve based their claims. One assessment in his study claims that a project will benefit Indigenous people by improving fishing in the area once it is reclaimed because people will be able to fish in “pit lakes,” despite the fact that other sources indicate concern over fish tainting. These 10 items are only some of the important things to be mindful of as we begin to understand the complex relationship that Indigenous people have with the state and with resource development in Alberta and elsewhere. Educating ourselves on the complex relationships between Indigenous and settler peoples, communities, and the state is an important step toward meaningful reconciliation, and an effort we must continually engage in. Many Indigenous peoples and communities are connected to the resource extraction industry in numerous and complex ways – further complicating this is the long history of colonialism that shapes the relationship between people and the state. Moving forward, governments, industry, and settler populations need to appreciate the fundamental differences between dominant Western knowledge and forms of Indigenous knowledge which can further complicate these relationships. With Indigenous youth being the fastest growing population in the province, Alberta’s future will be tied to this population. However, with education and career pathways for this population currently limited, Alberta needs to appropriately invest in Indigenous youth to support their future. Dr. Angele Alook is proud member of Bigstone Cree Nation and a speaker of the Cree language. She recently successfully defended her PhD in Sociology from York University. Angele currently works in the labour movement as a full-time researcher for the Alberta Union of Provincial Employees. Nicole Hill is a PhD student in the sociology department at the University of Alberta and a research assistant at the Parkland Institute. She is a graduate of Athabasca University’s Master of Arts in Integrated Studies program where she focused on equity studies. Ian Hussey is a research manager at Parkland Institute, where he designs, conducts, and manages political economy, labour, and climate research. This article was first published by the Parkland Institute .